Originally published in the Nov/Dec 2017 issue of Newport Life Magazine. When Portsmouth native, Kirsten Lawlor, and Anthony Asfur of Utica, New York, were enjoying their Christmas Eve lunch at Castle Hill, Kirsten started to feel suspicious. Tony hadn’t finished his cheeseburger, which was unusual considering that they were at his favorite restaurant. Once he began his heartfelt speech, her suspicions were confirmed. After meeting five years earlier on Siesta Key, Florida, Tony was down on one knee. 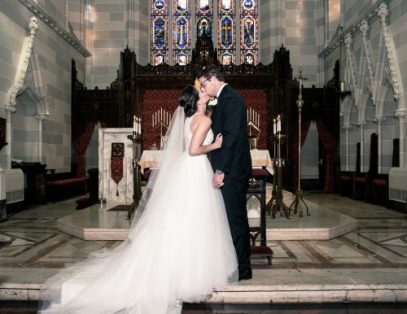 The couple tied the knot in Newport, and agreed their favorite moments were hearing each others’ answers to their perspectives on love. Kirsten fell head over heels for a Maggie Sottero ball gown with crystal buttons, crystal straps, a plunging illusion V-neck, and a tulle skirt. 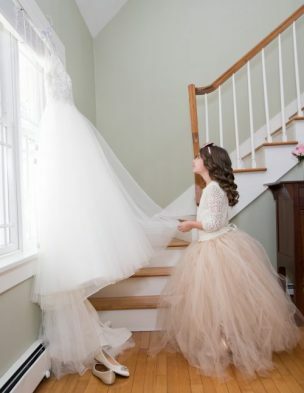 The flower girl complemented the bride perfectly in her own pink tulle skirt. The couple took a gamble with the weather, planning their nuptials for February. New England winters are notoriously treacherous, and with 75 percent of guests traveling from out of state, Kirsten and Tony were well aware of the risks. 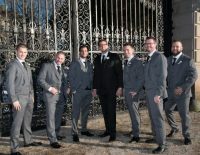 Luckily, the skies were clear and the temperature moderate on their big day. 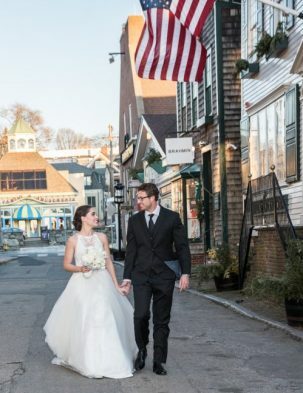 Historic and nautical were the two buzzwords in both the ceremony and reception venues. St. Mary’s Catholic Church and the Marriott included both, and were also centralized locations for all of the out of town guests. After honeymooning in Las Vegas and San Francisco, they settled back down in Bradenton, Florida where Kirsten is a guidance counselor at Manatee Technical College and Tony works in nuclear medicine at The Heart Specialist of Sarasota.